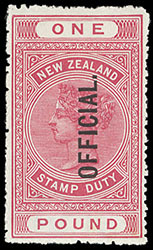 New Zealand, Official, 1913-14, 2sh-£1 Postal Fiscals, perf 14, vertical overprint, o.g., 5sh never hinged, bright color, a Very Fine set. SG No. O82-O84 £750 ($980). 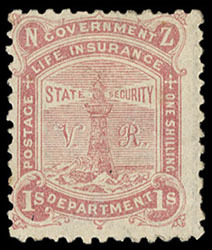 New Zealand, Life Insurance, 1891-98 ½d-1sh Lighthouse issue, basic set of 6 with first three value the later perf issues, o.g. 1d & 2d without gum, strong colors, a Fine set. SG No. L4//L10 £1,685 ($2,210). 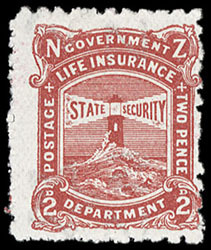 New Zealand, Life Insurance, 1905-37, ½d-6d Lighthouse, "VR" omitted, simplified set of 11, includes the scarce 2d red brown perf 11, full o.g., all with rich colors, bright and fresh, F.-V.F. ; 2d red brown with 1973 R.P.S.L. certificate. SG No. L21//L35 £2,014 ($2,650). 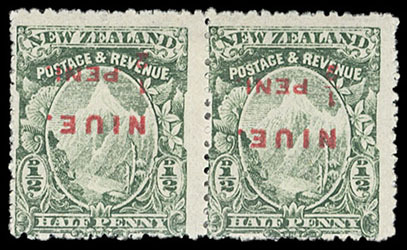 Niue, 1902, ½d green, inverted surcharge, o.g., hinge remnant, fresh and Fine, from an old-time collection (1930's). Scott No. 3a. SG No. 3b £650 ($850). 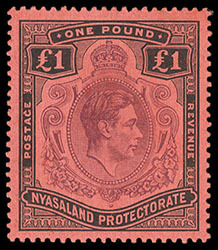 Nyasaland, 1938, King George VI, £1 purple & black on red, serif on "G", full o.g., hinge remnant, bright and fresh, choice centering, Very Fine and choice, a scarce plate variety. Scott No. 67 var. SG No. 143c £1,100 ($1,440). 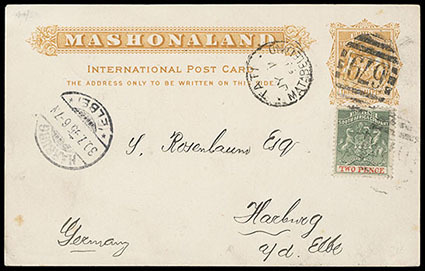 Rhodesia, 1892, Arms, 2d deep dull green & vermilion, uprating on 1893, Arms, 1½d brown yellow postal card to Hamburg, Germany, tied by "679" barred oval cancel with matching "Tati, Metabeleland, Jy 1, 95" cds alongside, receiving cds and Capetown transit backstamps, Very Fine, ex-Holmes. Scott No. 3. SG No. 20 Estimate $250 - 350.